Since the 16th century India had been a vast empire ruled by the Mughal princes, descendants of Genghis Khan and Tamerlane, who had come through the Khyber Pass from Central Asia (Mughal = Mongol). They were Moslems, ruling a population which was overwhelmingly Hindu, and the official language of the court was Persian. The situation was therefore always potentially unstable and precarious. Their power base was in the north, around Delhi and Agra, where their most famous buildings, such as the Taj Mahal, were Islamic in style and owed little or nothing to Indian traditions. For a while the great Mughal emperors, Babur, Akhbar, Jehangir and others, were the richest and most powerful monarchs in the world, but after the death of Aurangzeb in 1707 the empire went into rapid decline. In 1739 Delhi itself was sacked by the Persians under Nadir Shah. Emperors continued to reign on the Peacock Throne until 1858, but their authority was little more than nominal. Power passed into the hands of local princes, the Nawabs ("Emperor's representatives"), who did their own deals with European traders, and even used European troops in their battles with each other. Once Portugese explorers had found a way round Africa in the early 16th century, other countries wished to cash in on the fabled wealth of the Indies: originally spices, but soon other luxury goods as well: silk, tea, opium and porcelain. The British East India Company was founded in 1599-1600, with a royal charter giving it a monopoly of trade with the Far East. The original target was what is now Indonesia, but in the mid-17th century British merchants there were driven out by the Dutch, and instead concentrated on bases on the coasts of India: Calcutta in the north-east, Madras in the south-east and Bombay (now Mumbai) in the west; the latter coming from Portugal as a dowry for Charles II's wife, Catherine of Braganza. A French East India Company was founded in 1664 and established its own bases: Pondicherry near Madras and Chandanagore near Calcutta. Robert Clive, a Shropshire man, was born in 1725. He showed early signs of the mental instability which was to recur many times in his life. He went out to India at the age of 18 as a "writer" in the East India Company; a position which carried only a miniscule salary, but offered possibilities for a young man of initiative and enterprise to make very large sums of money for himself. Such opportunities soon presented themselves. In the 1740s England and France faced each other in the War of the Austrian Succession. The governments in Paris and London had no plans for the fighting to extend to India, but the French Governor-General, Dupleix, was ambitious, and by allying with the local Nawab he was able to capture Madras in 1746. The town was restored to Britain in a peace treaty two years later, but in fact fighting in India never really stopped. Clive first made his name in 1751 when he led a raiding party which captured the Nawab's capital of Arcot and then held it against a besieging force of 10,000 French and native troops. As a result of this, a pro-British Nawab was installed and Dupleix was recalled to Paris in disgrace. The Seven Years' War broke out in Europe in 1756, but a crisis had already erupted in India. The Nawab of Bengal (Bangladesh) had seized Calcutta and imprisoned the British residents: the famous incident of the "black hole", which oddly enough attracted little attention at the time. Clive came by sea from Madras, regained Calcutta and in July 1757 at Plassey, with just 800 Europeans and 2000 native troops (sepoys), defeated a much larger native army. The Nawab was deposed and killed, and replaced by his pro-British cousin, securing British control of Bengal. Fierce fighting followed around Madras before the French base of Pondicherry fell in 1761. These were to prove decisive turning-points in world history. India was for Britain a remote and mysterious land, to which young men sailed to seek their fortunes. Most of them were never seen again, but a few returned many years later fantastically rich, though often suffering from strange diseases and addicted to opium. They were nicknamed the "Nabobs", a corruption of Nawab. Clive himself received the enormous "present" of £234,000 from his friend the Nawab (worth hundreds of millions in today's money). He returned to India in 1765, and persuaded the Emperor in Delhi to grant official recognition to British control of Bengal and Bihar. He entered Parliament in 1761 as M.P. for Shrewsbury, but found his methods savagely denounced, and faced a Parliamentary inquiry in 1772. He did not live long to enjoy his fortune; committing suicide in 1774. But the East India Company did not prosper.Although its control hardly extended beyond Bengal and the other bases, it was not equipped to govern a province and maintain a private army; and it was forced to ask for government assistance. In 1773 Lord North's government passed a Regulating Act, which established a Governor-General, assisted by a Council nominated by the British government and the E.I.C. The first Governor-General was Warren Hastings. The British government in these years was obliged to give its full attention to the war of American independence, and Hastings was left without any assistance from London as he tried to establish efficient administration and to thwart the French, who were attempting to regain their position in India while Britain was distracted. In these tasks Hastings was successful; sending an army right across India to prevent a threat to Bombay, and extending British control into Oudh. Many of his methods were undoubtedly ruthless, though he was noted for his respect for Hindu traditions and for the beliefs of the Moslems of Bengal. He was constantly undermined by enemies on his own council, who fed back horror-stories to London. In 1783 the Duke of Portland's government, generally known as the "Fox-North coalition" proposed an India Bill which would establish greater government control. The E.I.C. was alarmed, and put out propaganda accusing the government of confiscating its wealth; Fox's enemies feared he would use the vast riches of India to keep himself in power for ever, and King George III, who hated Fox, let it be known that anyone who voted for the Bill would be considered the King's personal enemy. The India Bill was duly defeated in the House of Lords, the government was promptly sacked, and William Pitt, aged just 24, was installed as the youngest Prime Minister in British history. By this time around 15 Nabobs sat in the House of Commons, and supported Pitt over this issue. Pitt passed his own India Act in 1784, which in fact was not very different from Fox's proposals. 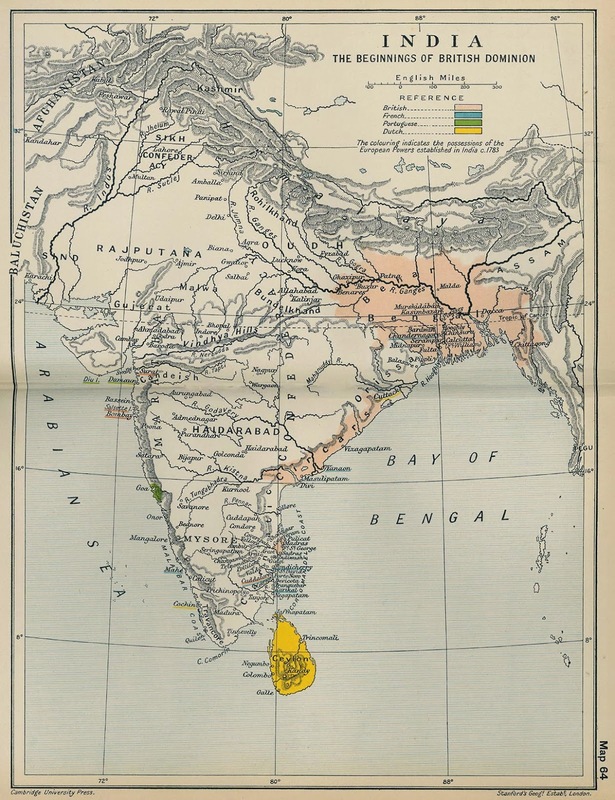 British India was to be under the dual control of the Crown and the E.I.C., with a Governor-General in India and a Board of Control in London, headed by a cabinet minister. This structure was to remain in place until the Indian Mutiny in 1857. The next few years were to be dominated by a sensational event: the trial of Warren Hastings. In 1788 the great Whig orator and philosopher Edmund Burke moved for the impeachment of Hastings; that is, a state trial, with the House of Commons acting as prosecutors and the Lords as judge and jury; the charges being misgovernment, tyranny and extortion. William Pitt as Prime Minister could have prevented it from going ahead, but it seems he was genuinely shocked by the charges, and possibly he was not sorry to see his Whig opponents being distracted from criticizing his government. Here are two cartoons by James Gillray. The first is entitled "The Political Banditti assailing the Saviour of India". 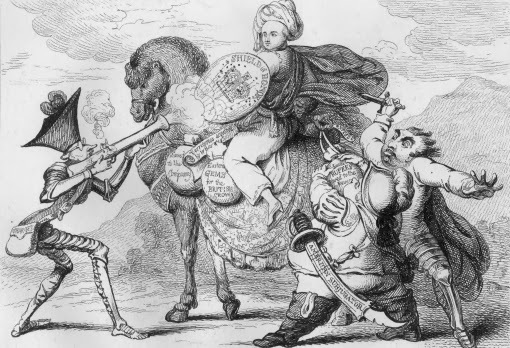 Edmund Burke (with blunderbuss), Charles James Fox (with dagger) and Lord North (with battered sabre labelled "American subjugation") are attacking Warren Hastings, who is defending himself with the "shield of honor". The second is much more ambivalent. Under the sign of the crown the "State Jugglers" are performing their tricks. The Prime Minister, William Pitt, is producing awards and medals from his mouth, in the centre Warren Hastings vomits out a stream of gold, and Lord Thurlow, the Lord Chancellor, breathes out fire and brimstone. Below, government supporters clamour for rewards. Fox, as leader of the opposition, creeps up onto the platform from behind, hoping to grab a share of the loot. Above, King George III and Queen Charlotte play on a see-saw. For seven years the Whig leaders, Edmund Burke, Charles James Fox and the playwright turned politician Richard Sheridan thundered their magnificent oratory against Hastings. 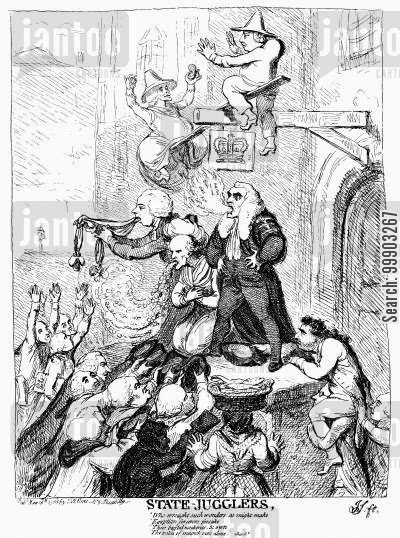 But gradually public interest waned, until in 1795 only 29 lords had followed the proceedings sufficiently to give their verdict, which was overwhelmingly for acquittal. By this time Hastings, who had had to spend vast sums organizing his defence, was bankrupt. The result was therefore unsatisfactory for all sides, but at least it demonstrated that officials in India were answerable for their actions. Hastings was awarded a handsome pension by the East India Company, and lived till 1818. 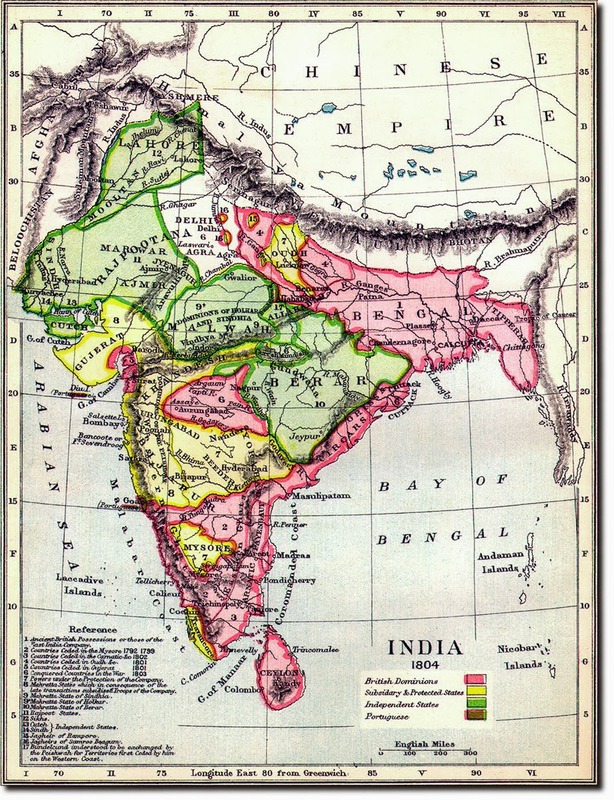 As yet Britain controlled only a few scattered areas of India, but this was soon to change. The French East India Company collapsed in the French Revolution, but with the renewal of war between Britain and France in 1793 the French placed their hopes on the anti-British prince Tipu, Sultan of Mysore in southern India. The new Governor-General was Lord Mornington, an Irish nobleman, who brought out to India his younger brother, Arthur Wellesley, later to become the Duke of Wellington. Wellesley had at this time no experience of battlefield command, but in 1799 he defeated and killed Tipu at Seringapatam, and then in 1803 gained a stunning victory at Assaye, when heavily outnumbered, against the Maratha princes who dominated central India. For the first time, Britain was now the dominant power on sub-continent. Arthur Wellesley returned home a rich man, and was soon to employ on the European continent the military experience he had gained in India. 1. The first of the nabobs, back in the early years of the 18th century, was Thomas Pitt, nicknamed "Diamond" Pitt. He had gone out to India at the age of 20 in 1673, had risen to be Governor of Madras, and brought back home an enormous diamond which he eventually sold to the Duke of Orleans, Regent of France, for £125,000. He then bought the notorious "rotten borough" of Old Sarum and went into politics. He became the grandfather of William Pitt the elder and great-grandfather of William Pitt the younger, both of whom served as Prime Minister. 2. Back in the 1960s the Indian cricket captain was a nobleman, the Nawab of Pataudi. After Mrs Gandhi abolished the noble titles, he had to revert to his name, which was Mansur Ali Khan; showing that he was a Moslem, and of Mughal descent.